What Is a Living Will in Cincinnati? A comprehensive estate plan should include preparations for the latter stages of your life. There may come a time when you become unable to communicate medical decisions. Advance directives for health care are used to account for this possibility. 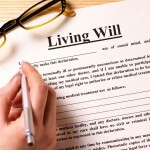 One of the advance directives that should be part of your incapacity plan is a living will. This type of will does not have anything to do with financial matters. A living will is used to record your preferences regarding life-sustaining measures. If you were in a terminal condition with no hope of recovery, would you want doctors to keep you alive indefinitely? Life-sustaining measures that are often utilized include mechanical respiration, artificial nutrition, and artificial hydration. When you create a living will in Cincinnati, you state your decisions on life-support in advance. This is not a very pleasant subject to contemplate, but you probably know how you would want doctors to proceed under these circumstances. Some people would want nature to take its course. Others would want life-sustaining measures to be implemented, for religious or other reasons. There is no right or wrong. This is a personal decision, and you should make it for yourself. If you do not have a living will in place when you become unable to communicate while in a terminal condition, your next of kin would be forced to make the decision on your behalf, which is an excruciating position for your family to be placed. There can always be lingering doubt in this person’s mind after the decision has been made. Different members of your family may have different ideas with regard to how the matter should be handled. This can add an additional layer of difficulty to an already challenging situation. Under these circumstances, family members should ideally be coming together to lend support to one another. This type of thing can escalate into a legal struggle. We have seen this in the past with the highly publicized case of Terri Schiavo. You can learn about her story here. There is no reason to go through life without a living will. If you consult with a licensed estate planning attorney, you can put your living will in place. You can also add another important advance health care directive called a durable medical power of attorney or health care proxy. Every medical scenario that could possibly arise will not be covered in the living will. With the power of attorney, you empower someone to make medical decisions on your behalf if it becomes necessary.